Pizza isn’t usually an option when you are low-carbing, but here is an excellent way to make your own low-carb option. It took me quite a long time to get my head around cauliflower as a pizza crust, it just didn’t make sense to me! However, it does work, amazingly effective and nice and simple to make at the same time as the regular pizzas in our house. 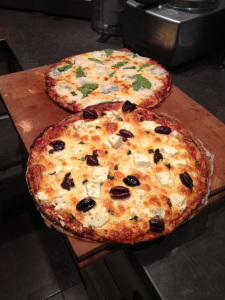 This recipe made 2x30cm pizzas, the photo is deceptive! Trim the cauliflower and, using a food processor, process the stalks first, then add the rest so that you have a very fine crumb. Pop the cauliflower in a microwavable bowl, cover, and blast for 8-10mins until cooked. Pour into a fine mesh sieve and allow to sit, draining any liquid as it cools. Once cool enough to handle pour into a bowl and add the egg and cheese, mix well.